Decorating for Christmas is one of life's win-win situations for me. I love listening to Christmas music at top volume and decking the halls for all I'm worth. The process of decorating for Christmas is a lot of fun. And then, when the fun decorating projects are done, my house looks festive and welcoming. But like many of you, I'm working to keep my holiday decorating costs as low as possible. One way I accomplish this is by adding free or inexpensive bolstering to decorating pieces I already own. A big difference for no money! It's amazing how adding fresh greenery to an artificial base works. Somehow the whole thing seems fresh. This display is in my entry hall. I bought four cheap poinsettias. The one in back is elevated on clay flower pot turned upside down. I like the way this gives the grouping a bit more presence, and the unsightly pedestal is hidden behind the flowers in front. The Spanish moss hides the tops of the plastic pots and keeps the attention on the flowers. I love the massing of flowers, and I spent very little money on it. Do you have any tips for creating a festive look you love without breaking the bank? Please share! Everything that you have done is just lovely! 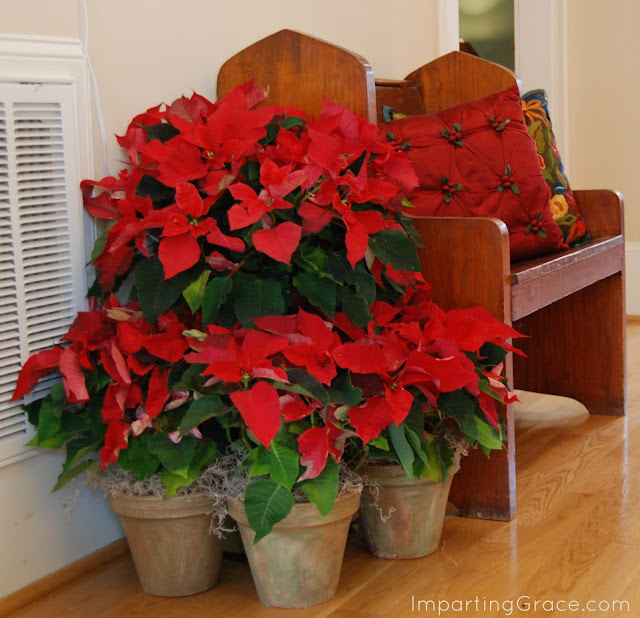 That poinsettia is gorgeous...I need to get to the nursery and see what they have in the way of Christmas inspiration. I never thought of adding real greenery to my fake wreaths...very clever...and it makes such a big difference...Everything looks so festive! 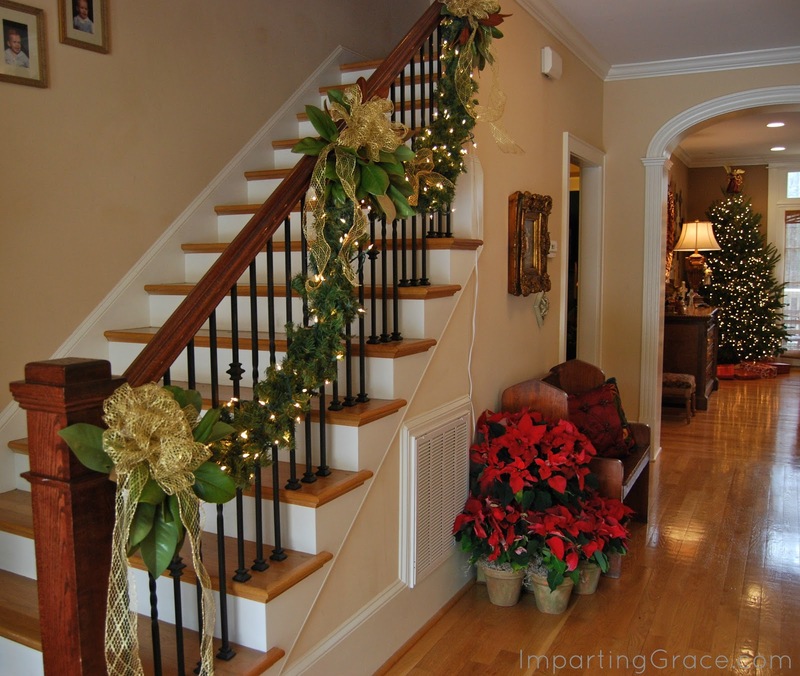 Richella, what wonderful suggestions for decorating for Christmas on a budget. 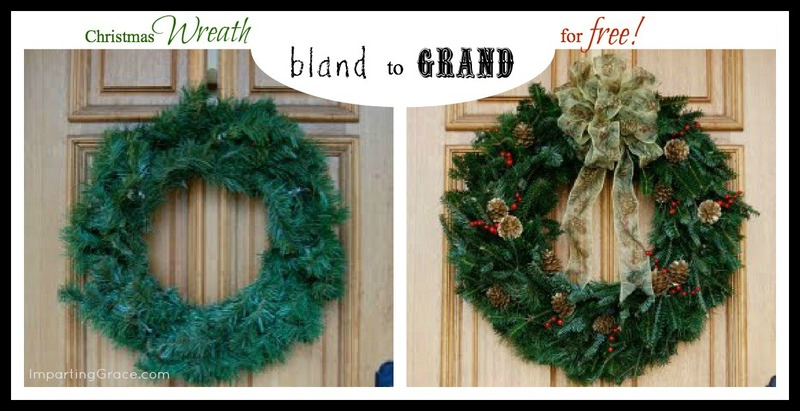 How beautiful the wreath becomes with those extra special touches. I too love red and green for my Christmas decorating with a few touches of gold. Lovely photos! I love your traditional look! I am a red and green traditional gal so I appreciate someone else who also is! You are one classy lady! I'm a red and green traditional gal myself with a little white and red thrown in. I love poinsettias! I have to remember to pick a few up when I go to the store. Thanks! you are such a smart girl! we have an artificial tree, but i gathered some clippings from a friend. now i gotta think about how best to use them!